Peggy Jo was born to Elizabeth and Earl Smith September 1, 1943 in Houston, Texas and passed away February 21, 2018. 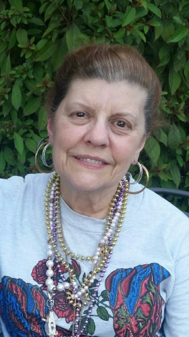 She was a 1962 graduate of John H. Reagan High School, lifetime member of the Houston Livestock Show and Rodeo and former employee of Dresser Industries. Before dementia crept into her life, she enjoyed oldies and country western music, dancing and all animals, especially cats. She was very creative indulging in painting porcelain dolls, tee shirts and ceramics, sewing and jewelry making. Peggy Jo is survived by her brother and sister-in-law, Earl and Dianne Smith, nephew, Earl "Scooter" Smith and best friend, Lois Samford. She chose cremation. In lieu of flowers, contributions can be made to the Alzheimer's Association, Houston Livestock Show and Rodeo, Houston Humane Society or charity of your choice. Please sign the guest book in remembrance of Peggy Jo. To send flowers to the family of Peggy Jo Russell (Smith), please visit our Heartfelt Sympathies Store.